Sometimes the difference between getting a workout in or not falls to that 15 minutes it takes to get to the gym. We get that everyone is busy, but working out isn’t just a good idea, it’s a necessity. Science aside, endorphins aside, you gotta do what you can to keep looking good. So sometimes, having the ability to work out without going to a place just has to be the way to go. And while we are huge fans of body-based weight workout sometimes you need a weight, for biceps, triceps, even forearms to get the job done. Free weights are necessary because they tend to work more muscle groups than weight machines. Unlike a weight machine, a free weight requires you to lift and steady the weight at the same time which requires more effort than picking up a weight that is on a slider and stabilized on its own. While an exercise machine may be able to build strength, free weights are necessary to sculpt and tone your body. The more you use free weights, the better you will look and the stronger you are going to be. So here’s our list of weights that you can get online and will end up underfoot and hopefully get rid of at least one excuse for not hitting the gym. In this update, we've found a new editor's choice product and we like it a lot. We've also updated our list with a few new products that should help you feel the burn even when you don't have to time to weight it up with all the other gym rats. There are a few different kinds of free weights. The most commonly used kind is the dumbbell. You can also use kettlebells and plate weights. All of these weights are sold at different price points and combinations. You are free to get weights individually or you can also get weights in a set. They can be used for a huge variety of different exercises and strength building routines. It is much easier to achieve your fitness goals when you work out with free weights so they are a worthwhile purchase for anyone who is serious about getting in shape or staying in shape. When all is said and done, despite all the new bells and whistles of the modern age, and despite the inevitability of next-Gen smart weights that will track your reps and total poundage (we’re making this up but it’s going to happen right? ), We’re traditionalists when it comes to lifting. Because at the end of the day, you want to get in shape, you move, and you lift weights, it’s really that simple. And if that’s what you want then this is what you need. No bells, no whistles, just a full set of weight that will let you do pretty much whatever you need when it comes to barbells. Really the best part because who wants random weights littering your workout area. Honestly we kid but this rack keeps everything well organized and up against the wall where it should be. And if you want to upgrade the rack has a 500 pound capacity so you can upgrade as you pack on the muscle. Classic, heavy and cool looking the hex shape keeps them from rolling around the floor and crushing your toes, or any small animals that might be slinking around the weight room. The weights themselves also have raised number so it’s easy to tell the weight you’re working with. For all these weights and the rack this is a great price. And once you’ve got this set up the sky’s the limit when it comes to doing what you need to do with dumbbells. Plus the ability to upgrade makes these dumbbells a great investment in your workout future. This is a dumbbell set that lets you add and remove weight as needed. It comes with a bar and weight plates which you add to the bar in order to increase the weight of the dumbbell. This will help you save on clutter in your workout area so that you do not need an entire set of dumbbells for your home fitness area. You increase the weight of the dumbbell by adding plates to it. There are four plates that weigh five pounds and then there are four 2.5 pound plates for smaller weight increments. The handles have a non-slip ergonomic grip. There are threads on the end of them where you screw the collars onto the handles and secure the weights without having to worry about the plates dropping. You can purchase this set at a price that is lower than the average price. The lower price is due to there be fewer weight options than what you may see in higher priced sets. The set comes with a storage case that is made of plastic. Both of the handles have a non-slip grip to prevent dropping. The plates have a semi-gloss finish and are made of cast iron. You can add and remove the plates as needed to change the weight. You do not need to worry about the set developing rust. The rubber collar has been known to pop out of place. Some users have issues with the paint chipping off of the weights. As the name suggests, this a set of general usage dumbells. You can use them in indoor and outdoor settings so they are perfect to use when you are free weight training inside and then take jogging with you later on outside. All of them are coated with Neoprene so that they last longer and resist rusting and corroding. When purchased in a set, you get a weight stand that is easy to put together. It's helpful to have since this will help to keep your fitness area organized. Circular dumbells are known to roll around on the floor. 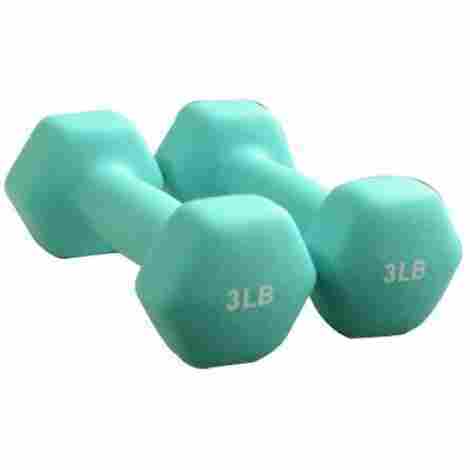 These dumbbells have a hexagon shape that will keep it from rolling around in the event that you put the weights down. 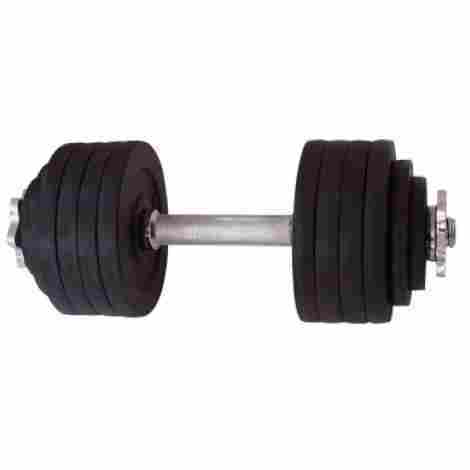 When purchased in a set, you will find these weights sold at a price that is lower than the average price. This makes them into an excellent value since you don't have to pay a premium for them. You can purchase them in a set or purchase them individually. There are coated with Neoprene so that you can grip them. All of the weights are color coated for easy identification. You can quickly read the number on the side of the weight. They have a hexagon shape that keeps them from rolling around. Some users have reported that the stand is poorly made. Other reviewers have reported that the stand collapses when the weights are placed on it. Here is another set of adjustable dumbbells. They are great for a home gym since they will require less space than a set of dumbells which will help to reduce clutter. You simply add plates to the handle so that you can get the desired weight and then screw the collar on tightly so that you can start your lifting routine. You can pick the amount of weight that you want in the dumbbell kit. The weight ranges from the forty pound kit all of the ways up to the two hundred pound kit. Each of the plates is made of cast iron and have a black finish. The finish will help to keep the iron from rusting so that the weights will continue to look new. The price range on this set varies depending on the size that you get. The forty pound kit is sold at a lower than average price but the two hundred pound kit is sold well above the average price. Each kit comes with a pair of handles and collars. You can choose between different weight kits depending on your needs. The handle is coated with chrome so that it stays shiny. The collars have a star lock so that they stay tight. All of the plates are painted black to resist rust. Users have reported that the star lock will not stay tight. You can't mix weights between the different kits. 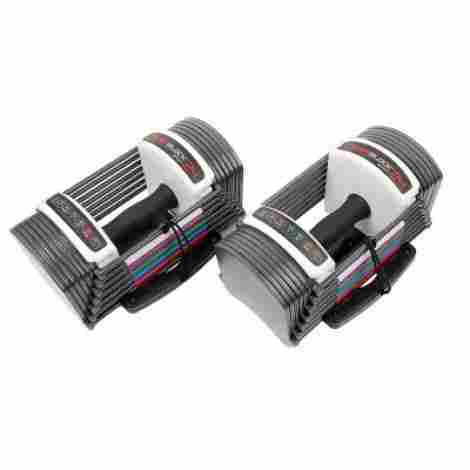 If you like dumbbells that adjust quickly, then you will love the SpeedBlock dumbbells by Power Block. These dumbbells have an adjustable weight that you can get set quickly so that you don't have long setup times between workout routines. They are ergonomically designed to help protect your hands and your wrists and are easy to use so that you can focus on exercising. They have a handle that is padded. The padding makes it easier on your hands and your wrists which will help to reduce injury from using the weights. You can adjust the weights in increments of three pounds. The range is from three pounds to twenty-four pounds on each dumbbell so you won't have trouble getting the proper weight. This is a premium product so you will need to plan on spending more than the average price on this product. The quick adjustability makes it into an excellent value. You can quickly and efficiently change the weight with these dumbbells. They adjust in increments of three pounds up to twenty-four pounds. It uses selector pins to change the weight quickly. The handles have been padded to help protect your hands and wrists. They have a 10-year warranty so they are long-lasting. Users have reported that the weights are noisy when they are using them. 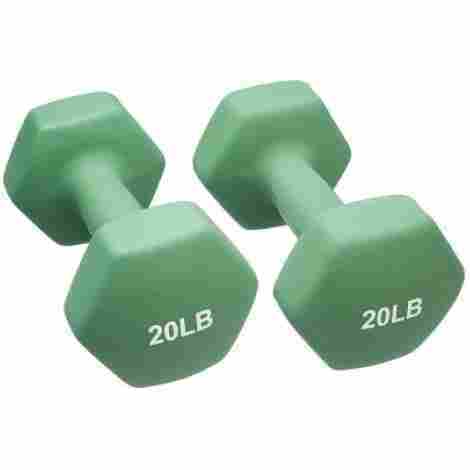 People who have large hands have trouble using these weights. 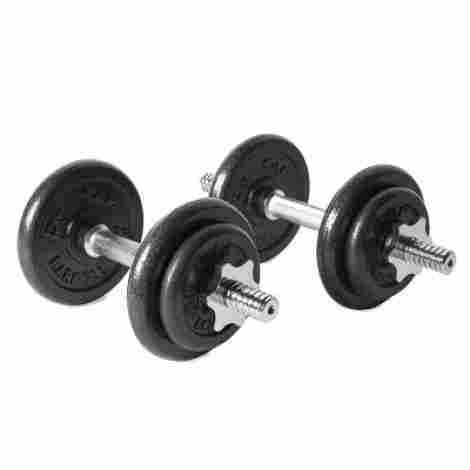 This is a pair of low-cost dumbbells. They aren't adjustable but you can pick the weight that you need in order to get the proper size. They are perfect for free weight training and are coated with neoprene in case you accidentally drop them. You can purchase the weights individually or in a set depending on your needs so they are a great choice. The weight is shaped in a hexagon. This shape is better than the circular weight because it will keep the weight from rolling away on your when you set it on the floor. The weight number is clearly printed on the side of the weight and they are color coded so that you can quickly and easily identify each of the different weights. 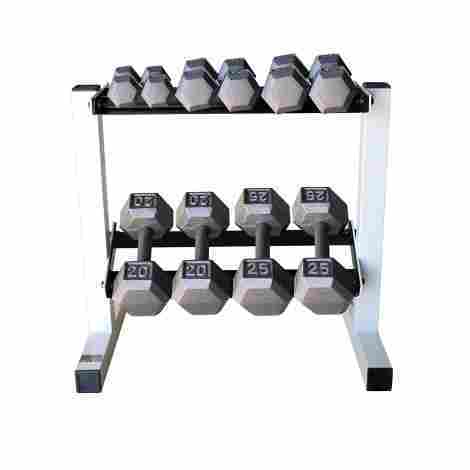 When purchasing these weights in a set, the price is slightly lower than the average price. 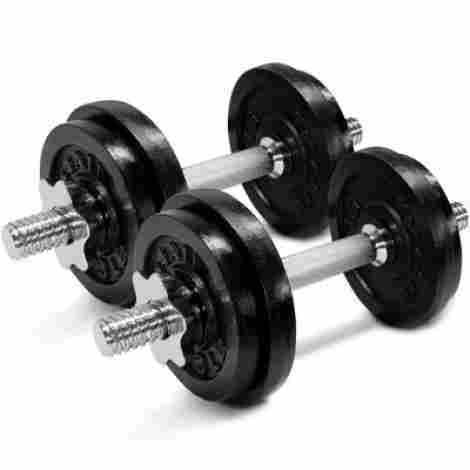 If you purchase the weights individually, then the price is highly variable and will depend on the weight size. You can purchase the weights individually or in a set. All of the weights are color coded for easy identification. The weight number is printed on the side of each weight. You don't need to worry about them rolling away on you. They are coated with Neoprene for comfort and easy gripping. Some users have reported that the weights are lopsided and hard to use. The stand is made of a lightweight plastic that isn't durable. A simple little barbell to keep handy in case you need a quick workout. It’s rubber encased so it won’t make a dent in your flooring and it’s also safe enough to keep at your desk at work just in case you need a quick bicep or a tricep fix. Point is this is a really well-made dumbbell that’s going to serve you well. It also comes in as many weights as you can imagine from 10 to 45 pounds. This is important because this means the weight is exactly made. But even more important it won’t fall apart over time. This is just one big giant chunk or iron. As it should be! Am I right? Seriously though, this is guaranteed not to bend or break. This is vital to us because we like our weights to stay put wherever we put them. As great as round dumbbells are we tend to like to keep them from rolling around the floor. It doesn’t seem like much of a big deal until you discover that your basement floor leans to the right… and there go your dumbbells. The Hexagon shape avoids all that. Sure it’s only one weight but it’s also a low price so you can afford to get a second for not much money and then upgrade as needed. This avoids having to lay down a lot of scratch for an entire set all at once. Adjustable dumbbells are a great option for a home workout area because it helps you to reduce space and clutter in your fitness area. 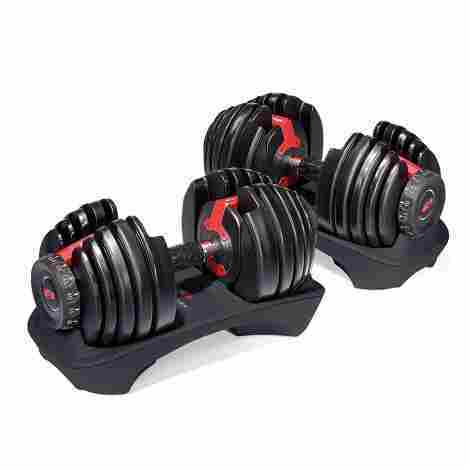 This set lets you reach a weight of up to 105 lbs between both of the dumbbells so even the strongest weightlifter will feel challenged when they are lifting with this set of dumbbells by Unipack. The plates are made of a strong and heavy duty cast iron. The handles are plated with chrome so that they continue to look nice and shiny. This will help your set last for a long time. You can adjust the weight on the dumbbells by adding and removing plates. The more plates you have on it, the more the dumbbell will weight. This lets you switch weights as needed. You will find this product sold at a price that is higher than the average price. The higher price is because it has a large range of weight which adds to the cost. The plates are made of cast iron and the handle is chrome plated. There are three different size plates sold in the set. The collars screw onto the handles to securely hold the weight. The handles have a non-slip surface that helps you hold onto the weights. You can adjust the weight in increments of 2.5 pounds. The collars do not always stay tight during your workout. You can't switch weights quickly which increases the setup time. Kettlebells are great for toning muscles. They allow you to do exercises that involve a swinging motion so that you can tone quickly. You can also use them for regular dead weight lifting. 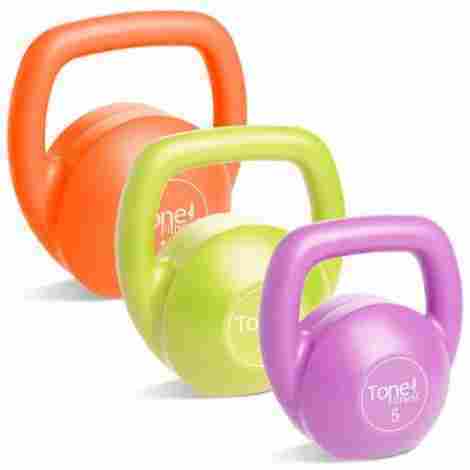 Tone Fitness sells kettlebells in a set or individually so that you can purchase the ones that work the best for your needs so that you can tone up. The handle is smooth which makes it easy for you to hold onto the kettlebells. This will give you a firm grip whenever you are doing exercises that require you to swing the kettlebells. You get an instructional DVD when you purchase the kettlebells in a set. This will help you get started when you aren't sure what sort of exercises you can do with them. When purchased in a set, the kettlebells are sold at a price that is lower than the average. The lower price turns them into a great option for your home fitness area. You can purchase them individually or as a set depending on your needs. They come with an instructional DVD that is perfect for beginners. You can use them to add variety to your workout routine. The handle has a smooth surface that lets you get a great grip. All of them are filled with cement rather than cast iron. Users have reported that these kettlebells are oversized for the weight. Other users have reported that the handle is hard to grip. We like these weights of course because it’s a great all in one package. Plus it’s Bowflex, and while their commercials might not be the coolest their name is synonymous with exercise equipment for the home so you know that a lot of thought went into manufacturing these babies. The idea is simple, one handle, and many weights. Sounds very democratic but honestly if convenience is important, or if you just don’t have much space this is a great option. It’s a simple idea with one handle you can simply dial up your weight using Bowflex’s unique dial system. This eliminates clutter and allows you to easily dial up your workout and your weight without switching between weights scattered all over the room. The dumbbell adjusts from between 5 to 52 pounds in 2.5 pound increments. That’s ideal for a long-term workout. Just in case you’re skeptical about how this actually works you have a two year warranty on plates and parts. So in case something doesn’t work well you can just send it back or get a replacement. We appreciate a company willing to stand behind its equipment. Not cheap, but you’re not just paying for dumbbells you’re paying for ending workout room clutter, and you’re paying for a unique dialing system that puts all your weights on one handle. And you’re paying for the Bowflex name and a two-year warranty. So while the price tag ain’t small you’re getting a lot for you money. A pair of free weight is a great addition to any home gym. They will help you to learn stability and control while building muscle and toning your body. Many people love to have a set of high-quality free weights since you can use them for multiple purposes. For example, you can use them when you are lifting but they are also great to have when you are jogging and need to burn additional calories. You can purchase these weights in a set as well as individuals so they are affordable for just about any one’s budget. There are different kinds of weights that you can pick from as well. For example, some people have dumbbell sets while other people prefer to have kettlebells. Of course, there isn’t anything that says that you can’t have both kinds of weights in your collection either. Successful bodybuilders normally have a diverse set of weights of just about every size, weight, and shape so that they can build muscle and tone. Owning a high-quality set of free weights is a great way for you to work your muscles and get into shape or maintain your figure if you are in shape. When you are picking out a set of weights, you are going to notice that there are two main kinds of weights that you can pick between. One kind if a fixed weight while the other kind is an adjustable option. It’s important to understand the differences between the two different kinds so that you can get the type that is proper for your needs. Fixed size weights tend to be the more common between the two different styles. A fixed weight is a free weight that has a constant weight. You can get them in dumbbells, kettlebells, or plate weights. The size and the weight do not ever change so you are going to need to get more than one weight in the event that you need different sized weights. This is the main disadvantage of fixed size weights because you will need more room to store them when you are not using them. It can also lead to additional expense and you add more weights to your collection. Adjustable size weights are weights that allow you to add or remove weight depending on how much weight you are going to need. They typically have some sort of a mechanism that holds plates to the weight so that the weight doesn’t fall off while you are exercising. The advantage of having adjustable weights is that you can reduce clutter and you have a complete range of weight with a single item. However, these weights cost more and normally have an abnormal feel to them when compared to fixed size weights. You are also limited to dumbbells with an adjustable weight as well. There are three main categories of free weights. They are the dumbbell, plate weight, and the kettlebell. None are necessarily better or worse than the other and many people have a collection of the different options in their exercise area. However, some weights are better suited to one kind of exercise over another kind which is why people tend to have a diverse collection. Dumbells are one of the most commonly used kinds of free weights. These are weights that have a grip bar in the middle and then plates on both ends of the bar. You put your hand between the weights on the grip bar in order to use them. You can get lots of different kind of dumbells in terms of size, color, and construction but they all look about the same. Kettlebells are shaped in a ball and have a handle on them. The bottom of the ball is flat so that they don’t roll over when you put them on the ground. You can use kettlebells for deadlifting but they are also great for exercises that require you to swing the weight since you can easily hold onto them while performing such motions. The final kind of weight is the plated weight. These are simply circular plates that have a slot in them for you to grip them with your hands. There are plenty of different exercise routines that you can perform with such weights but abdominal workouts are a well-known use case for plate weights. When you are building your collection of weights, you will most likely want to include all three kinds of weights. Most free weights are made of cast iron and therefore require some form of a coating in order to keep them from getting rusty. The type of coating will affect how the weight looks as well as how it feels when you are holding it. The type of coating may affect your floor depending on your floor and the type of coating that is used. Finally, some coatings will let you take the weight outside without you having to worry about it rusting if you get caught in a light rain or it’s humid outside. Paint is one of the most common kinds of coating used for protecting weights. Higher quality weights normally have a higher quality paint while lower-end weights have a less expensive paint. The paint used will be oil based to repel water and it will most likely have anti-rusting agents in it as well. Chrome is another popular finish that is normally used on the handles. It gives the weights a shiny appearance but tends to be more durable than regular paint. Rubber is another commonly used coating material. One of its main advantages is that it will protect the floor in the event that you accidentally drop the weight, however, rubber can also mark up your floor as well. There is also vinyl, which is normally used on weights that are made of concrete rather than iron. Vinyl is useful because it will not mark up your floor if you put it down. Finally, there is urethane which is a plastic-like material that is used to coat free weights. It is the most durable of all of the coatings but it can also last the longest. There are two ways that you can purchase free weights. One way is to purchase the weights individually while the other way is to purchase them in a set. For some people, it’s better to purchase weights in a set rather than purchase them one at a time. The main reason is that you will get all of the weights that you need in one purchase and each weight will normally cost less per weight. Many of these weight sets come with a stand so that you can organize your weights as well. This can be a great way to help you get started in the event that you decide that you want to furnish a home fitness area. However, there is a reason to purchase free weights individually. One of the reasons is that you simply may not need an entire set of weights. For example, if you started by purchasing a set of weights and then only needed to add one or two weights to it that didn’t come in the set initially, then it doesn’t make sense to purchase an entire weight set. Some people only want a pair of small weights for jogging rather than strength training and therefore don’t need a full set of weights either. You may also choose to purchase weights individually because you are getting adjustable weights. The main downside of buying weights individually is the cost. Set weights are normally discounted to help keep the entire cost of the set down while individual weights have a higher markup. If you need to build an entire collection from start, then you should go for a set of weights rather than individual weights. When you are purchasing free weights, you are going to want to consider the quality of the weight in order to make sure that you get a good weight. Low-quality weights can cause issues such as looking bad but they can also lead to injuries in some cases so you are going to want to make sure that you get good weights to avoid such issues. There isn’t a lot that can go wrong when it comes to free weights, but there are a few trouble areas that you need to watch for. One common area is the coating. Paint and chrome coatings can crack and chip off of the weight which will leave the weight exposed to moisture. Later on, the moisture can lead to rust which will cause the weight to look old and worn out. Higher quality weights have better paint and chrome finish so you may want to spend a little extra in this area. When the weight has rubber, vinyl, or urethane coating, you should try and make sure that it isn’t broken or cracked. Otherwise, the coating will break and peel off of the weight which can leave the inside of the weight exposed to the atmosphere. Adjustable weights can have additionally quality issues. Some of these weights have a screw on the collar that holds the weight plate onto the handle. Many times this collar can get lose which can cause the plates to fall off. If the adjustable weight uses pins, then the pins can stick and it may not hold the weight plates securely or allow them to release when they should. When it comes to adjustable weights, you can typically avoid such issues by getting a higher quality weight set. Q: Are free weights better than machines? A: Most people consider free weights to be better than machines. Free weights require you to maintain additional control over the weight and maintain stability on your own. This will cause you to work additional muscles which will sculpt and tone your body better than what machine weights are capable of doing. However, it’s better to use machine weights if in situations where you may have trouble stabilizing free weights such as when you are rehabilitating a muscle. Q: How do free weights cause you to lose fat? A: Muscle requires more calories than fat does. As you increase your muscle mass by using weights, your body is going to use more calories to maintain the muscle which causes the fat to get burned up by your body. Essentially speaking, more muscle is going to increase your metabolism which creates a calorie deficit and causes you to lose weight. This is why people who exercise with free weights will burn fat more quickly than people who do not use them. Q: Should I have a spotter when using free weights? A: Most of the time a spotter is not necessary. The only time you are going to need a spotter is when you are attempting to lift more weight than what you can handle. Some people do this when they are attempted to max out the amount of weight that they can lift or they are training for competitions. If you are only using weights that you are comfortable with lifting then it should not be necessary to have a spotter. Q: What is the difference between iron weights and concrete weights? A: In the end, both kinds of weights will weigh the same. However, iron is much more dense than concrete. This means that a weight that is made of concrete will have a smaller volume as opposed to a weight that is made of concrete. For this reason, cast iron weights tend to be more preferable to concrete weights since they are less bulky and are easier to use. Iron also tends to be more durable than concrete. Q: Why did dumbbell get its name? A: It isn’t truly known why this free weight is named a dumbbell. Many people believe it has to do with the silent bells that were used to build strength so that they could ring a church bell. These practice bells were silent and therefore called “dumb”. Later on, the rope was replaced with a solid bar that had weights on both ends and this may be the origin of the dumbbell. Jillian Michaels, What Are Free Weights?